The overall trend has been that if you're planning to stray from the relatively standard 10" tablet size, it's best to go lower, especially to that 7" target. Toshiba has another idea, a pretty big idea really, for an Android tablet. We saw this tablet before at CES, but we didn't really get much of a sense of it because it was never turned on. 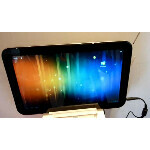 Now, there is some hands-on video of the tablet from the Toshiba World conference. The Toshiba AT330 looks like you'd expect an Ice Cream Sandwich tablet to look, but obviously, quite a bit bigger clocking in at 13.3". The tablet also has a bunch of ports, full size ports actually. There's an SD card slot, SIM card slot, and full HDMI port. Also, the model shown off had a built-in TV tuner and a retractable antenna as well. This feature makes it seem that this tablet is not designed for the USA since a TV tuner is not a feature we see much on devices that come here. Maybe there is another variant of the tablet made for a US release, but there's been no word on that. Of course, the tablet still sounds pretty solid, packing a Tegra 3 processor, a 5MP rear camera and 1.5MP front camera. It looks pretty good, but would you go for a tablet this big? I'd really like to know what the resolution is. Probably nothing crazy like 2560x1600. Thats getting to be the size a tablet should be. I think slates/Tablets/IPads should be the same size as a legal pad and weigh about as much thats when I'll be really interested in them but this looks like it's on the right path. I think im looking at my laptop replacement. A 10 inch tablet is just the right size for a consumer entertainment device, light and very portable but if you want something more like a real laptop replacement then you will have to go bigger. I think when Windows 8 comes out and you start seeing tablets meant for more then playing games and web surfing you will see tablets in the 15 to 17 inch range meant to really be used to replace laptops. That looks like a good piece of machinery right there....I would go for something like that, but I preffer a tablet that would have the same or better performance as a laptop.So far the Samsung Windows Series 7 slate is the only tablet that looks like it can compete to replace laptops.